Players from Southport FC have helped us to kick off a new era for insureTAXI. The team performed the official opening of our new centre of excellence in Southport, which our company insures more than 12,000 cab and taxi drivers across the country. We are now based on the outskirts of town on Slaidburn Crescent, the centre has been created following the merger of insureTAXI’s old Southport office on Princes Street with the Liverpool and Crewe operations. insureTAXI, part of the national insurance giant The County Group, have now launched a recruitment drive as we aim to increase our workforce in Southport over the forthcoming months. Head of marketing Claire Smith said: “We have been established in Southport for more than 10 years and have a great relationship with the town and local people. 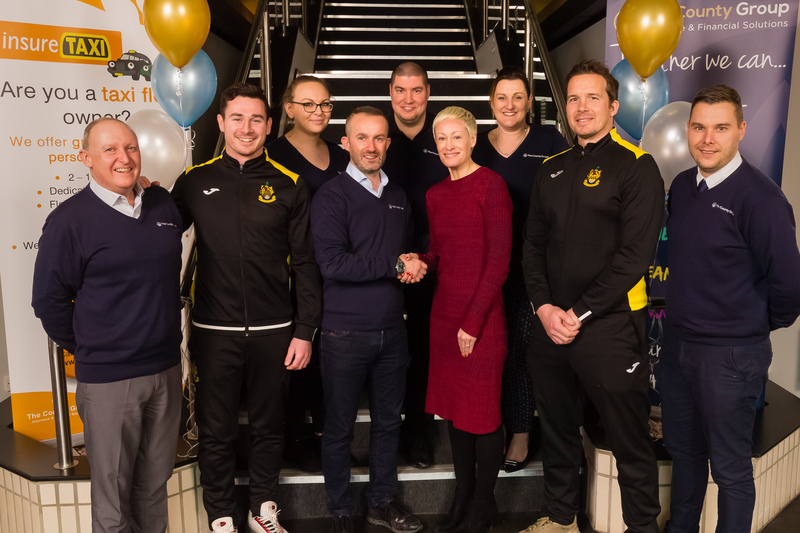 “Most of our employees live locally and people will recognise our name from our association with the football club where County Insurance has been first team shirt sponsors for the past two seasons. The County Group also has a second office on Hoghton Street in Southport town centre which specialises in commercial and business insurance solutions. Claire added: “The new centre of excellence gives us scope to expand. We hope to attract highly-motivated and enthusiastic professionals into a variety of roles. “We also offer apprenticeships and are looking to speak to local colleges and universities for people who want to earn whilst they learn. For more information please give us a call on 01704 530239 and we will be more than happy to help.